205mm x 253mm - 416 pages containing 90+ colour images, plus over 100 line drawings and score samples. It also contains a 23 track, 79 minute CD of unreleased music and interviews. The book is a full-color volume featuring a Foreword by Howard Shore, an Introduction by The Lord of the Rings screenwriter/producer Fran Walsh, original sketches by John Howe and Alan Lee, and numerous images from the films. 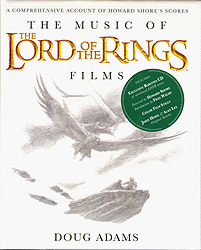 Also included in the book, courtesy of Howe Records, is “The Lord of the Rings: The Rarities Archive,” a CD presenting 21 tracks of previously unreleased music created for the films, and an audio interview with Howard Shore. Adams, a Chicago-based author and musicologist, was invited in 2001 by Howard Shore to observe and document his work on the popular motion picture trilogy. He attended recording sessions, examined the original scores, and was given complete access to the composer’s archives. As an acknowledged authority on Howard Shore’s music, Adams has become a regular fixture at concerts and events across the globe. He runs the popular blog, www.musicoflotr.com, which documents his work on this project and brings fans together in ongoing discussions. "Howard Shore's [LOTR] music has touched millions of people the world over," said Adams. "It's been my great pleasure to assemble a piece that chronicles the creation of this music, and examines exactly how it tells this classic story." "Researching Shore’s music has been a true adventure," described Adams. "His work is every bit as intricate and passionate as Tolkien’s Middle-earth." JW Braun's TORN TV Review at Youtube. Doug Adams' Blog concerning the book and CD.